I am always running out of battery on my phone, and my husband seems to always forget to charge his phone, every weekend when we go for our date night, it never fails that we are out of battery and have no way for the kids to get a hold of us. 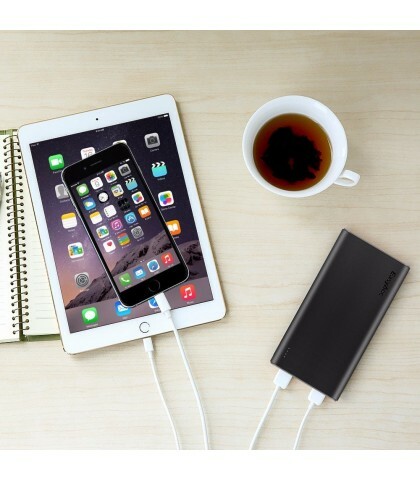 With this new portable Power Bank from EasyAcc, we don’t have to worry about that anymore, we hook them up in my purse and it charges both of our iPhones at the same time and it does so very quickly. I really like that this includes a light and it has two ports to charge phones with. It takes me 30 minutes to charge my iPhone 6 plus from 10 percent to 100 percent, that is pretty fast if you ask me. One charge of the power bank charges my phone about 3 times, maybe a little more. It will fully charge an iPad mini once before needing to be recharged. It comes with its own charging cord for a USB outlet and it charges in about 2 hours on my laptop. I try to remember to always have this charged and in my purse. If I were to get stuck somewhere with a dead phone battery and a dead car battery this could be a lifesaver. The most useful purpose I found for his charger was during a power outage, because you know that it never fails when you have a power outage your phone will not be charged either. I used it to charge mine and my sons, and we still had power in the bank. I am glad I have this and I think this makes a great gift too, everyone needs to have some power in the bank for the times they need it the most. You can go to EasyAcc and see all of the power banks they have available and you can pick this one up as well. Previous post: Do you have thinning hair or irratated scalp?